Flying to your mountain of choice is never particularly memorable and it almost always takes longer than the anticipated journey time. What if you could travel by ski train and reach your resort within a few hours? Wouldn’t it be nice to start your ski holiday from the moment you step onto the carriage. No budget airlines or popping ears, rather, a smooth ride out of the city, past the English countryside, with a relaxing scenic journey ahead of you. In addition to discovering a new mode of travel, you’ll be cutting your carbon footprint by a huge 85%. And with many of our ski resorts at risk from climate change, that should give pause for thought. Here's our pick of the best resorts by ski train . 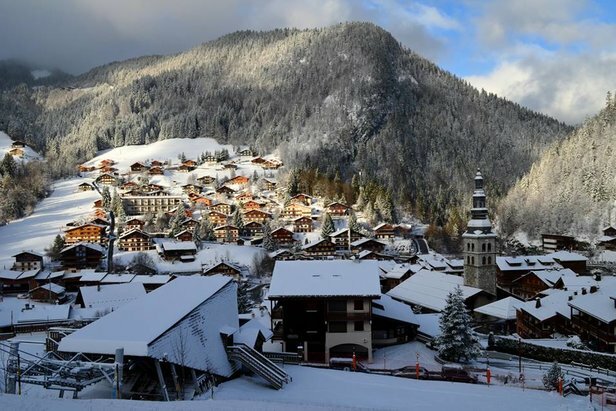 . .
Nestled in the Haute-Savoie region of the French Alps, pretty La Clusaz has a traditional French feel and ambience. The resort has five interlinked ski areas which make for a decent variety of terrain; it also has great, but relatively unknown, backcountry terrain. If you happen to visit during a full moon, check out the full-moon skiing party held throughout the winter. Mountainside bars are open with live music and dancing and plenty of good cheer! Lucky then that the resort can be reached in a matter of hours by ski train. By train: To reach La Clusaz, grab your glow-sticks and jump aboard the 07.55 Eurostar from London St. Pancras. Arrive in Paris-Nord and take a short taxi ride to Paris-Lyon. Take the 12.45 high-speed TGV (train de grand vitesse) to Annecy and arrive at 16.30 just in time to offload and hit the apres! 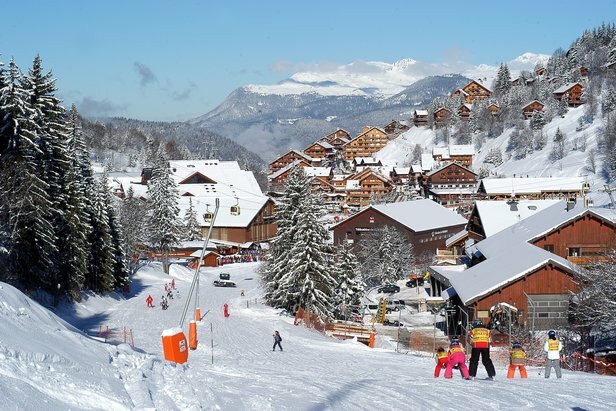 One of France’s most popular snowboarding resorts is extremely easy to reach by ski train. Les Arcs's nearest station is Bourg St Maurice and in the ski season there are regular Saturday trains during the day and overnight Eurostar trains on Fridays. 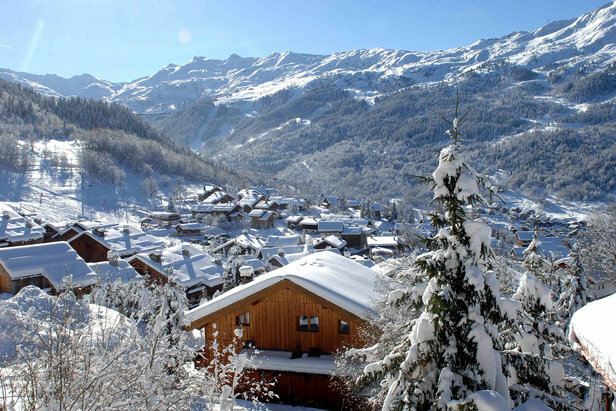 From Bourg St Maurice you can pick up a bus to resort or a transfer minibus. The train about eight hours from London. Before you know it, you’ll be in freerider heaven. 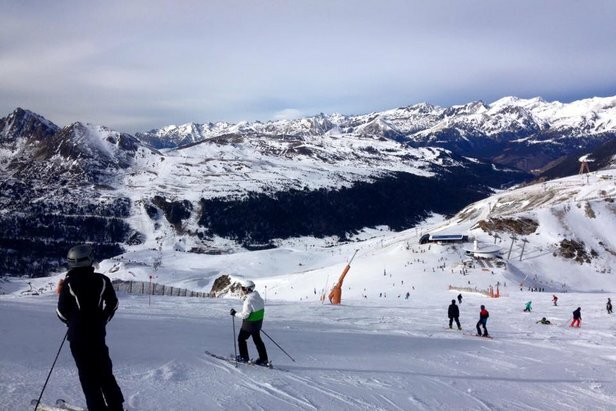 Other things we love about Les Arcs: its speed-skiing track and the recently completed Mille 8 development – complete with a brand spanking-new gondola to replace the Villards chairlift, a beginners' area with magic carpet and the ‘discovery’ blue run. What can we say? Les Arcs: it never fails to impress. By train: Depart London St. Pancras at 07.55 and arrive in Paris-Nord at 11.17. Transfer to Paris-Lyon and depart for Chambery at 12.45. Arrive in Chambery at 15.35 and take the local train to Bourg St Maurice at 16.29. Arrive in Bourg St Maurice at 18.19 and hop aboard the funicular train to Les Arcs in 7 minutes. In the middle of the expansive 3 Vallees ski area in the Tarentaise region of France sits Meribel, a beautifully designed resort made up of three neighbouring villages: Méribel Centre, Méribel-Mottaret and Méribel Village. For mileage, you won’t get better: the ski lift system offers access to 600km of piste and 120km of cross-country skiing. The apres is excellent too and is one of the best that France has to offer. By train: To reach it, depart London St. Pancras at 07:19 and arrive in Lyon Part Dieu at 13:00. Pick up a coffee and croissant before departing from the same station at 13.50 and arriving at Moutiers at 16.20. 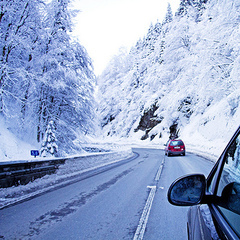 If you’re taking the daytime direct Eurostar Ski Train, then a shared transfer service between Moutiers station and the resort is available to take you to your chalet or hotel comfortably and for a modest price. The service, run by Three Vallee Transfer in partnership with Snowcarbon and 3 Vallees Association, means that from approximately €35 per person you can be met at the Moutiers station by a driver who waits for the Eurostar to arrive, and then brings you to the door of your hotel or chalet. 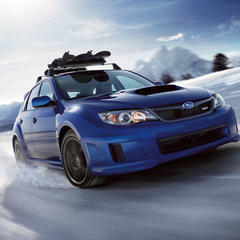 The same service is available from Meribel to Moutiers. Traditional, pretty and trendy, Montgenèvre is a hit with young families. 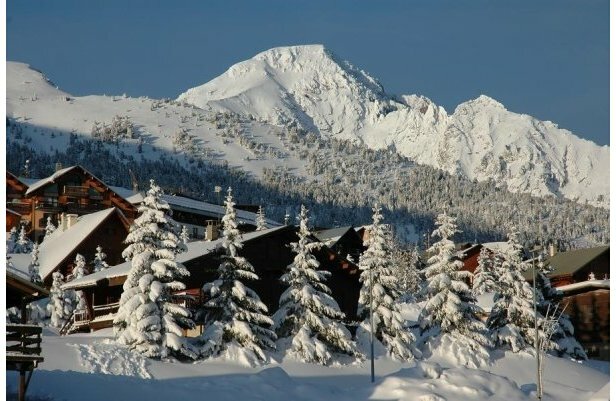 The resort has a wide range of intermediate-friendly slopes and is connected to the vast Milky Way ski area. Beginners have sun-facing slopes next to the village and snow cover is enhanced with the resort’s snow-making machines. By train: Hop aboard the 09.22 Eurostar ski train from London St Pancras. Arrive in Paris-Nord and transfer to Paris-Lyon. Take the 14.41 high-speed TGV to Oulx and arrive just in time for dinner and drinks at 19.23. The ski resort of Alpach is one of the most picturesque villages in the Tyrol ski area. 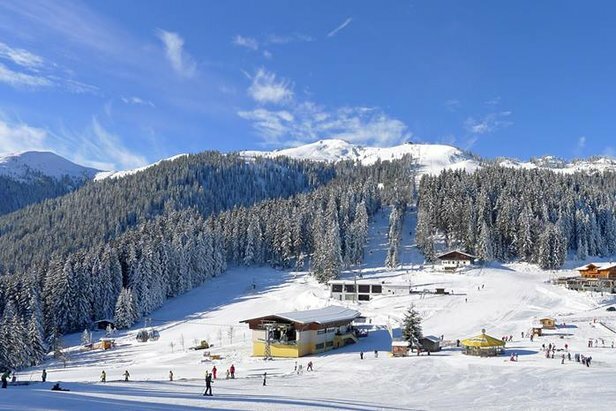 An eight-person gondola links the Alpach side of the resort with the Wildschönau valley; together they make up the Ski Juwel region which comprises the resorts of Reith, Oberau and Niederau. Alpach itself is small and compact, the vibe is family-friendly and the nightlife is buzzing. Non-ski activities include winter walking and an open-air ice rink at Reith. By train: To get there from London, take the 06.57 ski train from St. Pancras to Brussels. From Brussels, hop on the 10.25 InterCity Express to Frankfurt. Take the 13.54 to Munich, arriving at 17.07, and the 17.38 EuroCity train from Munich to Woergl arriving at 18.49. Standing at the foot of the striking Jungfrau mountain range is Wengen, a gorgeous alpine village in the Bernese Oberland. The village is charming and atmospheric, with a family-friendly feel and low-key nightlife. Non-ski activities include “flight-seeing” by helicopter, heli-skiing, as well as 20km of winter walking trails, eight curling rinks and miles of toboggan runs. 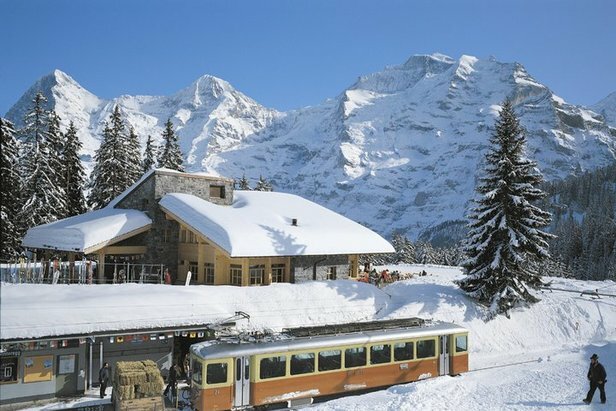 Three resorts, Grindelwald, Wengen and Murren, are covered by the Jungfrau regional lift pass so what are you waiting for? Time to travel to the chocolate-box land. 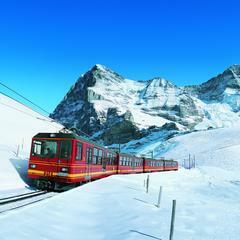 By train: While you can travel by ski train from London St. Pancras to Wengen there are a number of changes. 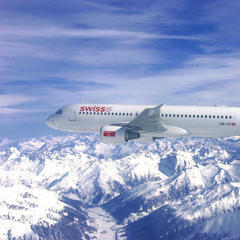 If you’re travelling with your brood, we recommend getting a flight to Bern or Zurich. From there, take a direct train connection via Bern to Interlaken Ost and onwards to Lauterbrunnen. The last bit of the journey is reachable only by rail from Lauterbrunnen and takes just 15 minutes. Located in the heart of the Pyrennees, Grandvalira is a huge ski area that comprises Pas de la Casa and Soldeu as well as a number of lesser known resorts. It has benefitted from investment in recent years and has become a great all-round resort. It’s the only resort in the Pyrenees with four snowparks and a freestyle academy. 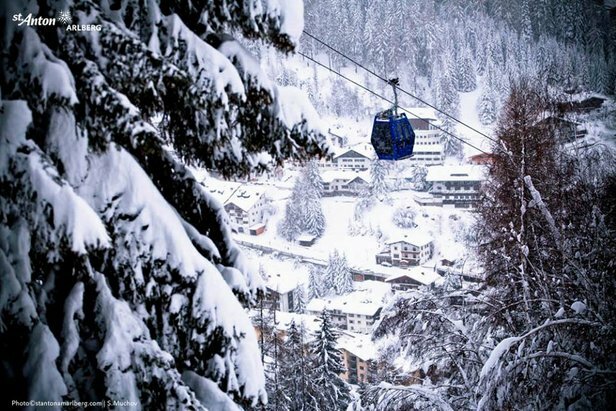 For the 2015-2016 winter season, the resort has made the biggest investment in its history – some 16 million Euros. A new cable car in the Abelletes area is under construction and the resort’s many terraces are being revamped. By train: Hop aboard the 16.22 ski train at London St. Pancras and arrive at Paris-Nord at 19.47. Transfer to Paris-Austerlitz and depart from there at 21.56. From there, you can sleep on the couchette sleeper all the way to L’Hospitalet where you’ll arrive at 07.20, fresh and ready for the first ski of the day. Extreme off-piste terrain and hard-core drinking go hand in hand at one of Austria’s better-known resorts. Altogether there are 280km of slopes served by 85 lifts in the Arlberg ski area (which also includes the resorts of St Christoph, Lech, Zürs and Stuben), so skiers of all levels will find plenty of accessible terrain. Having said that, it’s a resort best suited to intermediate and expert skiers. One of our favourite routes is the racecourse from Kapall; the couloirs off the Schindlergrat are gnarly and the no-fall zone off Valluga Nord presents some terrifying opportunities to test yourself. By train: To reach it, depart on the ski train from London St. Pancras at 07:55, arrive in Paris Nord at 11.17 and transfer to Paris-Lyon. Take the 12.23 train to Zurich arriving at 16.26. Depart Zurich at 16.40 and arrive in St Anton at 19.03.